Heroic marketing! | Andy Sernovitz | Damn, I Wish I'd Thought of That! How can you become a true hero? For less than you spend on a normal, boring ad? 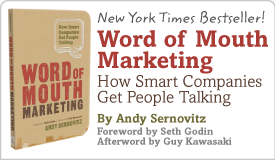 Answer that question and you’ll become a master of word of mouth marketing. United Services Automobile Association, an insurance company that caters to members of the military and their families, is paying for the Air Force football team’s entire trip to Navy this weekend — a tab of $230,000, Air Force Academy Athletic Corporation CEO Derm Coll said Friday. With the game in jeopardy of being postponed due to the federal government shutdown, Air Force essentially tasked with raising the money for the trip through entirely private funding. So Coll began to reach out to various supporters of Air Force athletics, including USAA, a major corporate sponsor. At lunchtime Wednesday, Coll said he had no money raised. A few hours after conversations started with USAA officials, they had pledged to pay for the whole trip. The PR, word of mouth, and goodwill earned by USAA is priceless. How are you going to blow people’s minds with a heroic gesture?